Kachina Bridge Dinosaur Petroglyph: Proof That Humans and Dinosaurs Co-existed? Is the Kachina Bridge Dinosaur Petroglyph proof that humans and dinosaurs co-existed? Did the Hopi Indians actually see a sauropod? Look at the following image. Pretty remarkable example of a sauropod (a gigantic, long-necked, long-tailed dinosaur such as brontosaurus or diplodocus), isn't it? I got this from Answers in Genesis. It's all over the internet, but if anyone knows where it's from please tell me so I can give proper credit. We all know how untrustworthy our eyes can be in matters like this. We easily see form similar shapes into familiar items. But what about this item? Is it possible to analyze it more closely? Somebody did, though it was scientists who believe in evolution, of course. As I point out repeatedly on this site, anti-evolutionists prefer hopes and vague possibilities to reliable, concrete conclusions based on continued research. The handling of the Kachina Bridge Dinosaur Petroglyph is an excellent example of that truth. A couple of scientists, Phil Senter and Sally Cole, did the obvious. They went and got a closer look at the petroglyph. This was no easy task, as the Kachina Bridge Dinosaur Petroglyph is about an hour off the nearest road by foot, and it sits on a sheer cliff face about six feet over the head of an observer. Still, a better viewing of the petroglyph is hardly an insurmountable task. So Senter and Cole looked at it, and they reported their findings. That link is just an abstract of the paper, but the conclusions are easy to understand. The Kachina Bridge Dinosaur Petroglyph is not a petroglyph at all, but petroglyphs. It is two separately made petroglyphs with some mudstains underneath them. The Smithsonian blog has a drawing from Senter and Cole illustrating what they found. The illustration on the right shows the two petroglyphs, made at separate times, and the mudstains below. I compared the drawings with the picture above, and I didn't like the comparison. The fact is, though, that in the image at the top of this page, both images are enhanced. Here is how the petroglyph actually looks to the human eye (based on comparing images I could find through Google Images, which was a lot of them). I got this from dailymail.co.uk. It's all over the internet, but if anyone knows where it's from please tell me so I can give proper credit. This picture is less clear, but more up close. You can see the spiral in front of the head. You can also see how all the "legs" could easily be mud stains, slightly different in color and significantly different in texture from the "body." 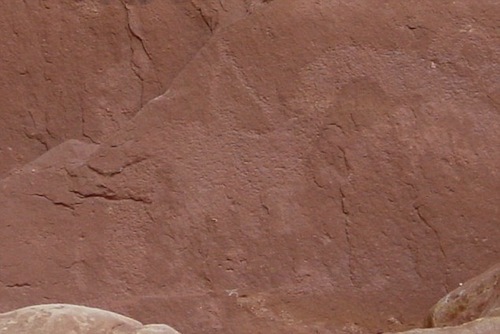 Only the pitted portions are petroglyph, and there is a noticeable gap between the "tail" and the "body." Here I want to point out that those who oppose evolution—whom I hesitate to call creationists because those of us who believe God created us through evolution are creationists as well—have written a refutation to Senter and Cole. However, before addressing their refutation, I want to point out that no anti-evolutionist has bothered to do their own study and paper on the Kachina Bridge Dinosaur Petroglyph! As I stated above, anti-evolutionists prefer vague possibility to concrete research. I am convinced that it is because deep down they know that their position cannot bear scrutiny. The refutation is found at Answers in Genesis, which has made strong efforts, in my opinion, to make their site more scientific and less obviously unreasonable, for which I commend them. Unfortunately, this refutation, which is embarrassing at best, managed to make it up in March of this year (2011)! Most of what he writes I will leave to you to read if you want, as it's irrelevant once we address his objections to the fact that the Kachina Bridge Dinosaur Petroglyph is not a petroglyph but a combination of two petroglyphs and some mudstains. An artist can easily use multiple images to composite a whole image. This is often done by artists today. But if such a prerequisite was applied to secular interpretations, Lucy, which is a composite, must be rejected in the alleged human evolution debate. I recently wrote a blog post titled, "There's Such a Thing as ... ." This is a perfect example. "There is such a thing as" artists using multiple images to composite a whole image, but that begs the question of whether it's reasonable to apply that thought to this image, the Kachina Bridge Dinosaur Petroglyph. And, of course, it is not. We are trying to determine whether—against everything we know about the fossil record, the age of the earth, humans, and dinosaurs—indians saw a live sauropod in Utah one thousand years ago! Are we going to do that on the basis of a not very accurate rendering produced by two petroglyphs that look like a snake when combined plus some mud stains that only faintly resemble legs? I included the remark about Lucy because I find the childish taunt astonishing. First, he's repeating a well-known falsehood. Lucy is not a composite. It is true, however, that many Australopithecus afarensis fossils have been found and that scientists rightly use the various fossils to come up with a complete picture of what the A. afarensis species looked like. Is it really possible that Ishmael Abrahams, the author, can't figure out the difference between the relevance of a composite origin for a work of art and the relevance for determining the morphology of an extinct species without our having to explain it to him? I don't think it's possible; I think he's simply making a petulant remark, which could perhaps be overlooked in the heat of debate, but which is inexcusable on a web site supposedly devoted to the scientific study of origins. But why assume it is not part of the image? Using stains of mud or other sources of coloring was common for artists. Furthermore, the under surface has been through years of weathering, which we would expect to affect the surface. Such a find is not to be misconstrued as having no original human input. They did? The mud stains, which really don't look like legs at all once you separate them from the pitted area created by one of the original artists, were put there by an artist who suddenly switched from whatever method he was using to a mud stain? 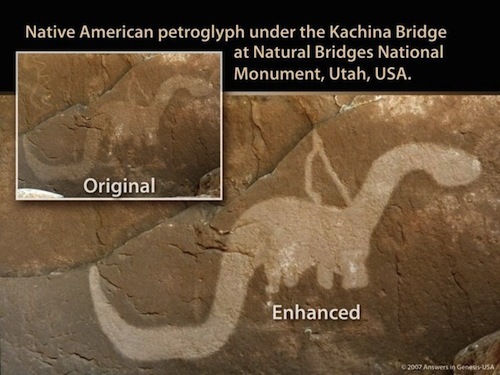 On what basis does Mr. Abrahams remark that the original artists of the Kachina Bridge Dinosaur Petroglyph used mud stains? Does he offer any examples? Does he quote anyone? In fact, does he do one iota of research himself, or does he just pick at Senter and Cole's scientific paper with arguments more suited for elementary school. What Mr. Abrahams means is that he hopes there is a possibility that the native american artists of a thousand years ago used mud stains in addition to their other methods of etching the rocks. He doesn't want to find out whether it's true, because those who oppose evolution prefer vague possibility to concrete research. I'm somewhat frightened that I'm demeaning myself even answering these childish complaints which Answers in Genesis allowed to be printed on their web site as though they were arguments. So all the researchers did was . . . look at it? They performed no paint test, etching experiments, weathering experiments, animal shape research, or researching related rock art in the region? Senter and Cole did not only look at it. They studied it under various lighting conditions with both the naked eye and binoculars, and they noted some things that are obviously true even to those of us who are limited to photos such as the ones on this page. This is significantly more than Mr. Abrahams, or any other anti-evolutionist, has done, and it has been quite sufficient to end the debate about the Kachina Bridge Dinosaur Petroglyph.